Ailsa, over at wheres my back pack challenged us to find a photo illustrating rhythm. In most catholic countries the calendar is punctuated by a large number of saints days and festivals, each one being an occasion for celebration and for the ritual of the procession through the streets carrying an image of the virgin. There is rhythm in the succession of the dates as well as the rhythm of the people walking in the procession and the bearers who carry the image on their shoulders whose rhythm is probably somewhat less regular than that of the other participants. 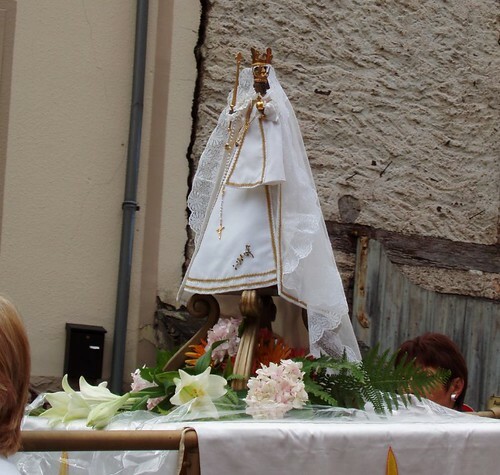 In the small town of Vianden in the north part of Luxembourg (that small country wedged in between France, Germany, Belgium and Holland) we watched the statue of the Virgin Mary being paraded round the streets as part of the celebration of the Feast of the Assumption in mid-August. Calendars definitely carry a rhythm!